Please join us for AFSC’s Annual Reunion on October 19-20 as the Aggies B.T.H.O. LSU. As if moving to the SEC is not exciting enough, this year our reunion will be moved back into the MSC and Choral Activities Office. The MSC looks amazing and if you have not had a chance to check it out, reunion will be the perfect time to explore the new space. Reservation is under John Fry, AFSC. ***Rooms are very scarce. We have a limited number of rooms reserved on a first come basis. Rooms that are not paid for will be cancelled 31 days before reunion. Please make your reservations ASAP. The football game is SOLD OUT! All former Singing Cadets and their families who do not have tickets or do not wish to attend the Aggie football game are invited to visit the Choral Activities suite (MSC) where we will be showing the game on the big screen. I hope you will make it a point to attend the 2012 Fall AFSC Reunion. There is plenty to enjoy whether you attend the game or not. Let’s welcome our new friends from the SEC and give them a glimpse of the Aggie Spirit. 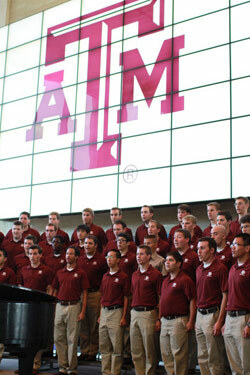 For more information regarding the AFSC’s Annual Reunion, please email us at FormerSingingCadets@AggieNetwork.com.